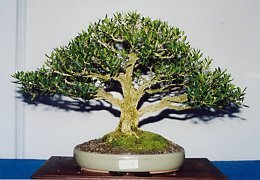 It was evident when I was in Malaysia recently that Bonsai is strongly supported by a good number of dedicated enthusiasts, some species which are used in Malaysia for Bonsai are various Ficus species, Juniperus, Triphasia trifolia, Senai, Ehretia microphylla, Pemphis acidula and the Wrightia religiosa which is the most popular plant used for Bonsai in Malaysia. The Society has been in existence for more than 10 years & Currently has approximately 400 members from all over Malaysia. Its objective is to promote the healthy hobby of bonsai and suiseki to the general public by holding regularly events such as exhibitions, bonsai and suiseki auction dinners, workshops and bonsai tours. The society holds bonsai workshop every Sunday from 10 am to 12 noon at its current club premise at PYRUS GARDEN, 32, Jalan Nyaman 12, Bukit Indah, Off Jalan Kelang Lama, 58200 Kuala Lumpur, with the aim of teaching the art of bonsai to those interested. Admission is free and all those interested are welcome. Interested members of the public are encouraged to bring their bonsai plant to enable our "bonsai sifu" to guide them in the proper care and cultivation of the bonsai. A similar workshop will eventually be held for suiseki with the aim of promoting the art of suiseki. The details of this workshop will be announced soon. No 95, Jalan Rukun Lima, 58200 Kuala Lumpur, Malaysia. Abu Hassan's main interests are Bonsai, Miniature Gardens & Full scale Gardening. Other Hobbies include rocks, minerals & fossil collecting. Occasionally traveling on excursions to source raw materials. The Malaysian Stone Lover Society. Unfortunately I have no information about this Club. You may be able to find out more by contacting Abu Hassan, who is a member of this club. Have a look at Curry Kuah's new website, besides the traditional bonsai styles, he creates different artistic styles and shapes.Through his website he shares his personal experiences and creative aspects of bonsai and takes you on an exciting journey into the world of artistic bonsai.. I'm a Malaysian Chinese living in Kuala Lumpur, Malaysia, and have been keeping bonsai for more than fifteen years as a hobby. From my personal experience I find this hobby most relaxing and challenging especially creating some artistic styles and shapes. It is for these reasons that I would like to share with you my experience by creating the Bonsai Art CD, a lot of thought, effort and time have been put on the Bonsai Art CD to make it as attractive and as simple as possible for you to follow. This is an ancestral career and business for The company has its ancestoral origin from Chao Zhou, a place which is famous with its pottery and porcelain artworks in China. The Company's present management is the second generation in Malaysia since its ancestor immigrated from Chao Zhou in 1940s. Continued from the ancestral's blood, professional knowledge and experiences in this industry, the present management is well mastering the techniques and skills of processing the overall clay/ceramic/pottery and porcelain production, and specialises in manufacturing, import, export, wholesale and retail of these products.